Almond, chocolate-dipped, triple chocolate. Light and crunchy and loaded with California almonds, Boncora Biscotti are baked and cut by hand, so the size of the cookies will vary. Chocolate biscotti are hand-dipped in a blend of Guittard semi-sweet chocolate. The 1 lb Dinner Party Bag contains 2 one-half lb. heat sealed bags. Almond = 26-30 biscotti per lb. ; Chocolate/Triple Chocolate = 16-18 biscotti per lb. 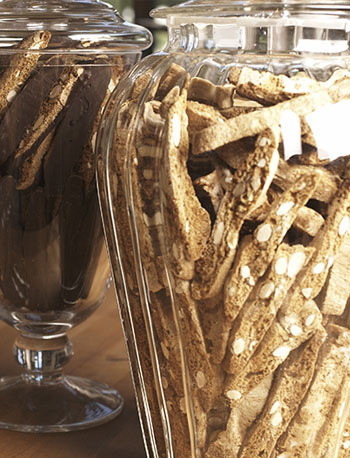 And please take note: From May 1 – November 1, all orders for chocolate biscotti shipping to locations outside California are packed with ice and must be shipped UPS second-day air.